Jessying - Malaysia Beauty Blog - Skin Care reviews, Make Up reviews and latest beauty news in town! : CHANEL CHANCE Eau Tendre Promotion! CHANEL CHANCE Eau Tendre Promotion! Catch the CHANEL CHANCE Eau Tendre Promotion at KL Sogo and enjoy a 15-min flash lip makeover* by their Beauty Advisor. 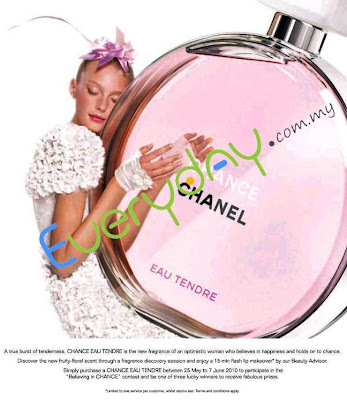 Also, participate in their "Believing in CHANCE" contest when you buy a CHANCE Eau Tendre during the promotion period. hi sorry but do u know how much is chanel chance tendre selling in malaysia?